Loraine Jelinek, a student at Albany Law School, has been selected as the 2016 recipient of the Judge Bernard S. Meyer Scholarship. Established in 2004, the scholarship is funded by Meyer, Suozzi, English & Klein, P.C. and administered by The New York Bar Foundation. The $5,000 scholarship is awarded annually to second year law students in New York State who excel in legal writing and advocacy. Previous winners of this scholarship have gone on to hold positions at law firms such as Cravath and Cadwalader, and as in-house counsel at organizations including Cancer Genetics, Inc. and NY Arc. To be considered for the scholarship, applicants must submit an essay that demonstrates legal writing skills and advocacy. Ms. Jelinek’s winning paper entitled, “The Criminalization of Indebtedness: The Contemporary Legal Ideologies of Debtors’ Prisons and the Recent Revivification of Peonage,” addresses how peonage in modern-day society is a problem that is escalating throughout our nation. Her paper discusses the need to shed some light on this issue, and hopefully, provide an authoritative voice for the individuals who may feel like they do not have one. “Receiving this scholarship is a great honor and I think it is a wonderful way to remember Judge Meyer.” said Ms. Jelinek. Ms. Jelinek will complete her J.D. from Albany Law School in 2017, where she is currently the Executive Editor for Notes and Comments for the Albany Law Review. She also works as a legal assistant at Spada Law Firm in Colonie, NY, and is a Law Clerk at the School Administrators Association of New York State in Latham, NY. The scholarship selection committee, which judged the essay submissions in a blind reading, was comprised of Andrew J. Turro, Member of Meyer Suozzi and Chair of the firm’s Equine & Racing Law practice, Hon. Michael A. Ciaffa, former Nassau County District Court Judge, and Emily Franchina, Chair of the Fellows of the New York Bar Foundation and a Past President of the Nassau County Bar Association. Judge Meyer was an Associate Judge of the New York Court of Appeals from 1979-1986 and practiced with Meyer Suozzi from 1987 through 2005. 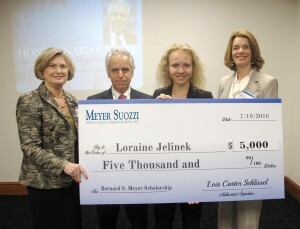 The Judge Bernard S. Meyer scholarship was established in his honor, to serve New York State’s legal profession.